September 1999, written by Yutaka Amatsu, Hiden 8 dan Hisa Takuma was born in 1895 and died 1980. His home-town is in Kochi-prefecture in Shikoku-island. Japan is consisted of many islands, main islands are, from north, Hokkaido, Honshu, Shikoku and Kyushu. Hisa graduated Kobe university (school-name was different at that time). When Hisa was a school-boy he was a captain of Sumo-club. Sumo is one of Japanese martial arts, two persons wrestle in a circle about 6 meters diameter, when pushed out of this circle or touch the ground any part of his body except bottom of his feet, he is defeated. Hisa won All Kansai student Sumo championship. Kansai is western part of Honshu. After Hisa graduated university he entered a commercial firm but that firm went bankrupt. After this Hisa entered Asahi newspaper company not the journalist department but the general affairs department. After 6 years he was promoted to the boss of that department. Asahi is a progressive newspaper, it was often attacked by right wings. Asahi newspaper company wanted to improve its guard power. Improving guard power is one of the general affairs department’s duties. In 1933 they invited Ueshiba Morihei, and started to learn Daito-ryu. Ueshiba Morihei later founded Aikido, but at that time he was a teacher of Daito-ryu. Hisa practiced Daito-ryu with guardmen and other co-workers every morning. He practised harder than anyone, because he was a boss of the responsible department. In 1936 an aged man came and said ”I am Takeda Sokaku, the teacher of Ueshiba, if you want to learn Daito-ryu well, you must become my pupils”. Hisa could not believe him, so he wrestled with him to test his skills. They were far better than Ueshiba’s. Hisa was surprised and run to Ueshiba and told it. Ueshiba run away to Tokyo without even greeting. Ueshiba was an excellent pupil of Takeda, he was given Hiden 8 dan, the highest dan of Daito-ryu, their relationship was good early days, but it became worse later, I don’ t know why, someone says because of money, someone says because of philosophy. Teacher changed to Takeda Sokaku, Hisa and other Asahi-men practised Daito-ryu harder than before . In March of 1939, Hisa was given Menkyokaiden (you are equal to me, I have nothing to teach you anymore), and 6 Asahi-men were given Hiden 8 dan. In his life Takeda Sokaku gave Menkyokaiden only to Hisa, he did not give it even to his son. After given Menkyokaiden Hisa taught Daito-ryu to Asahi-men and policemen of Osaka. Hisa retired from Asahi in 1944. In 1945 Japan was defeated in the World War 2, and all Japanese martial arts were banned to practice. After 3 years Japanese were permitted to practice martial arts again. Hisa opened his own dojo in Osaka, also in Asahi company Daito-ryu club revived, Hisa taught both in his dojo and Asahi club. In Hisa’s dojo excellent pupils are Mori ( Hiden 8 dan), Kobayashi ( Hiden 8 dan), Kawabe (Hiden 7 dan). In Asahi club Utsunomiya ( Hiden 8 dan) and I (Hiden 8 dan). But I think Daito-ryu is a little different in Hisa’s dojo and Asahi club. It is my personal opinion, I think there are three types of Daito-ryu. One is Aikido, Ueshiba-sensei wanted to make his Aikido popular, even children and aged people can enjoy it, so he abandoned foot skill. As Hisa taught me, foot has more power than arm, so practising is painful, it may be an obstacle to make Aikido popular, so Ueshiba abandoned it. Second is Takeda Tokimune’s Daito-ryu Aikibudo, Tokimune is Sokaku’s son, but he was not given Menkyokaiden, so he founded Aikibudo. He also wanted to make Aikibudo popular, so he abandoned some foot skills but to make a difference from Aikido he added hand’s Atemi. Hisa taught mainly this Aikibudo in his dojo, because he had to invite more people. In Asahi club Hisa had no need to invite more people, so he taught traditional Daito-ryu. Hisa taught me ”Daito-ryu’s strong point is to make use of foot-power, foot is stronger than arm”. This article is written by Yutaka Amatsu (Hiden 8. dan). He is one of the foremost students of Hisa Takuma. 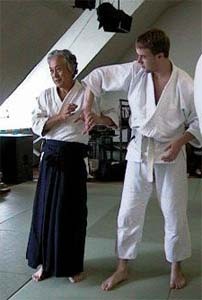 Amatsu-sensei visited Finland with other Takumakai’s leading teachers on August 1999.